Focusing on the positive aspects of Michael's life and what he gave to the world has always been the objective of the Estate, right from the beginning. The influence of Michael Jackson on pop culture and fashion, even ten years after his death, cannot be denied. It is demonstrated time and time again; this time by a timely MJ-inspired collection for Louis Vuitton. I think it's an interesting diversion and a "screw you" of sorts, to the Sundance Festival and Dan Reed's mendacious (Jermaine's choice of words) documentary. I respectfully disagree. The estate have been incompetent when it comes to dealing with this. The social media post was nice but everything else they have said implies that they would rather focus on projects that will make them money and let the fans defend than try and defend MJ. You could argue that the Estate doing a lot of PR work on the allegations only fuels the fire for these documentaries. Completely agree. At this stage, why draw more attention to it? It was indeed a great diversion, with very special, subtle messages for those who were meant to hear them. ^^^ This truly was a great moment in time. It was actually very funny to read the responses to it - the funny gifs, people having to check if the account hadn't been hacked by fans lol to going Whover behind this tweet, I love you to confirming that this is how you defend a KING! The comments were really endearing. 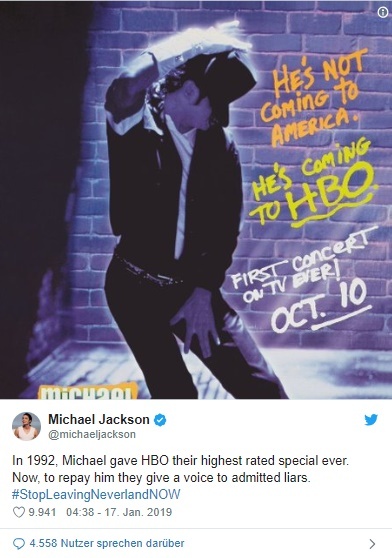 It has got to be the most popular and quite possibly the most important message to date from.....the Official Michael Jackson Twitter Page. They made a great point by reminding people of Michael's first concert in Bucharest - the concert that put the city on the map of every MJ fan. I had actually forgotten they aired it back in 1992. It is terrible to realize they can be so horridly ungrateful. When I first heard about their involvement I thought this was some sort of twisted revenge for the One Night Only show that didn't go through in 1995, due to Michael's collapse and subsequent hospitalization. If I'm not mistaken, they were supposed to broadcast it then. I didn't even think about the Bucharest 92 concert and the unprecedented success Michael gave the network. They truly are despicable. In any case, that one particular tweet rocked and I trust the Estate will keep on fighting for Michael on all possible fronts and further act in due time. Timing is almost everything. "But I have to say I really wish that the Estate would commission a reputable investigative journalist with documentation on the allegations of abuse, give him all the documents, and time to do his own research." People are not going to listen anyway if they are prone to brainwashing or have already been brainwashed, plus there's a lot of stuff out there already by fans and researchers to disprove the allegations, from Day One to today. I think, even if the Estate did this, it might not be effective. Online today, the media is jumping all over the story of the Sundance film, so you always have them in the wings waiting to pounce no matter what. Money talks. That's been the perennial problem--the media will feed any and all lies for profit. I mean, offering people huge sums of $$ to lie is not a good way to run a business, but that's the state of the media today. "Lies run sprints, truth runs marathons."